Diamonds sparkle, but colored gemstones tend, rather, to glow. Many of the most popular and valuable colored stones -- ruby, blue sapphire and emerald -- are treasured for their rich color rather than their glitter. Having said that, there are some colored gems which exhibit notable sparkle. 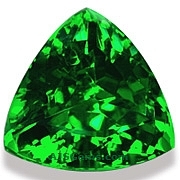 Lighter colored garnets, especially demantoid, spessartite and tsavorite, can display impressive fire when clean and well cut. So too for some pink and yellow sapphires. But the colored gemstone most famous for its sparkle is natural zircon. Indeed in the days before diamond simulants like cubic zirconia and moissante, white zircon was the most popular substitute for diamond. Zircon occurs in a range of colors, from white to honey, orange, cinnamon, red, green and blue. Of all the zircon colors, the distinctive blue is the most popular, since blue zircon has more sparkle than blue sapphire, topaz or tanzanite. Though lighter colored zircons -- especially the white and honey color -- show the most sparkle, blue zircon has exceptional fire given its vivid color. The zircon blues range from light to medium blue, sometimes with a slight greenish secondary hue. Blue zircon is produced by low temperature heating, but only some of the Cambodian and Burmese zircon will turn blue when heated. Compared to sapphire, spinel or tanzanite, zircon is still very affordable, and high quality specimens can be found in larger sizes as well. Since zircon is such a dense material, it is always a good idea to check the size as well as the carat weight when buying zircon. A stunning teal blue tourmaline in a large size! This is gorgeous clean material which has been beautifully fashioned in a precision radiant cut for maximum brilliance and fire. A rare and unique gemstone for the serious collector. Truly a one-of-kind treasure. Guaranteed natural and untreated. A lovely large rhodolite from the Umba River region of Tanzania. The best of the rhodolites from this location have a bright open color and are known in the trade as Umbalite Garnets. This is a very fine specimen, completely clean and very well cut. Guaranteed natural and untreated. An exceptional Imperial Topaz for the discerning collector. 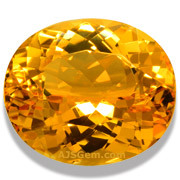 Gorgeous golden orange color with perfect clarity, this fine gem has been precision cut for maximum brilliance. Perfect size for an impressive ring or pendant. Guaranteed natural and untreated. An excellent large amethyst from Uruguay in a rich deep purple. Completely clean and beautifully cut in a precision radiant cut for added brilliance. Perfectly sized for an impressive ring. Guranteed natural and untreated. A top grade tsavorite in a rich velvety chrome green. Beautifully fashioned in an elegant trillion to display full brilliance and fire. This fine gem has amazing sparkle and will make a stunning ring or pendant. Guaranteed natural and untreated. Sales of rough jadeite at Burma's largest market in Mandalay have slowed to a near standstill in recent months, according to industry sources. The slowdown is due to factors on both the supply and demand side. Mining operations in Hpakant in northern Burma have stalled, due to escalating conflicts between the government and the Kachin Independence Army, after a 17 year ceasefire broke down in 2011. At the same time, a major anti-corruption campaign in China has deterred Chinese jade buyers, who routinely bribe local officials in China to facilitate smuggling of Burmese jade into the country. Two rare large diamonds highlight Sotheby's April 6 auction in Hong Kong. A 23.15 ct D internally flawless antique-cut diamond from the legendary Golconda mine in India is estimated to draw between $4.3 and $5 million. A 77.77 ct VS2 vivid yellow diamond ring has an estimated price of $6.8 to $7.5 million. 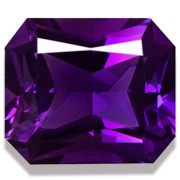 The portuguese cut is a faceting pattern that has more facets than the typical brilliant cut. 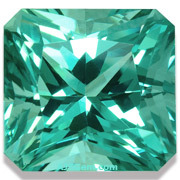 A round brilliant cut will usually have 57 or 58 facets while a round portuguese cut may have as many as 176 facets. There are many variations of the portuguese cut, but the goal in adding the extra facets is to achieve more scinitillation or sparkle. A portuguese cut will also tend to deepen the color, so you will often see lighter colored gems such as morganite, aquamarine and kunzite fashioned with a portuguese cut. For diamonds, clarity grade has a major impact on price. But for colored gems, color and brilliance are more important factors in price, provided that the clarity does not impact the overall beauty of the gem. Generally we look for a clarity grade of "eye clean" in colored gems, meaning that any inclusions cannot be seen with the naked eye from a normal viewing distance. 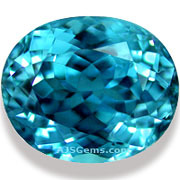 For lighter colored gems, such as aquamarine, a higher clarity grade ("almost loupe clean") is expected, since inclusions may be more visible. 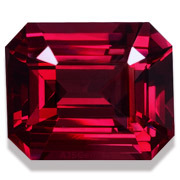 Some gem varieties, such as emerald, rubellite tourmaline and sphene, almost always have significant inclusions, so a lower clarity grade ("slightly included") does not lower their value if the color and brilliance are good.